Microscopic structures in the kidney that filter blood and produce urine. 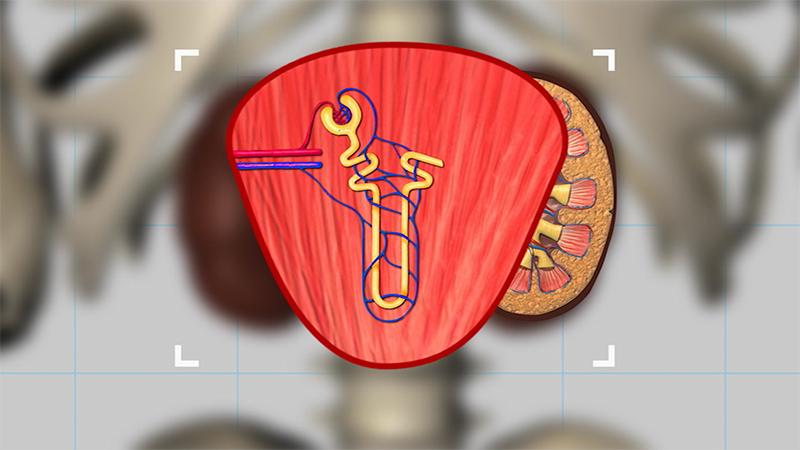 Microscopic structures in the kidney that filter blood and produce urine. Each nephron contains a structure called a glomerulus, which filters blood as it passes through. Any waste that’s collected then flows into a thin tube called a tubule, which allows useful nutrients and water to be reabsorbed into the bloodstream. Anything not absorbed is then excreted as urine. Camels, and other animals that live in desert environments, where water is scarce, have particularly long tubules. This maximises the amount of water that is reabsorbed, so less is excreted as urine. Each nephron contains a structure called a glomerulus, which filters blood as it passes through. Any waste that’s collected then flows into a thin tube called a tubule, which allows useful nutrients and water to be reabsorbed into the bloodstream. Anything not absorbed is then excreted as urine. Camels, and other animals that live in desert environments, where water is scarce, have particularly long tubules. This maximises the amount of water that is reabsorbed, so less is excreted as urine.